Nigeria is the centre of origin of the white yam (Dioscorea rotundata) because of the immense genetic diversity of this species in Nigeria. It therefore behoves Nigeria to have a pride of place in spearheading the development of yam production and processing technologies in the world like Brazil is doing in cassava. It is in this vein that note is taken of the Minisett Technique of seed-yam multiplication developed by the National Root Crops Research Institute (NRCRI), Umudike, which has reached mass adoption stage within and without the frontiers of Nigeria. Recently, the Dry- season Yam Production Technique was also developed in Nigeria, which is discussed hereunder. Yam is a sun-loving crop and the tuber yield is increased by the amount of sunshine to which the crop is exposed. The bottleneck in achieving this increase is that yam tubers have only one month of the year when most of them sprout, irrespective of method of storage- that is the month of February. A few precocious tubers sprout in January and some laggards in March. When the tubers sprout in February, they remain vining in the barn of the upland farmers until the rainfall resumes in March/April in the Rain-Forest and Guinea Savanna zones of Nigeria. But the onset of the rainy-season marks the beginning of increase in atmospheric cloudiness. In the months preceeding the rainy season is the dry-season with abundant sunshine. It then becomes logical that the best time to plant yam tubers is at the beginning of the dry-season in order to increase yam tuber yield by combining the sunshine of the dry season with that of the early phase of the rainy season. White yam takes 7-8 months from sprouting to tuber maturity when the yam vines dry up. Scientists at the Institute of Agricultural Research and Development (IAR&D), University of Port Harcourt, have developed a technique for changing the sprouting time of yam tubers to any month desired, instead of the month of February only. When the seasonal growth cycle of yam is changed, it remains permanent because there is a natural mechanism in the yam plant to sustain the perpetuity of this change. When the yam tuber is changed to sprout towards the end of September and the sprouted tubers are planted about the middle of October, which is towards the end of the rainy season, the sprouts emerge early in November and begin to grow under maximum possible sunshine and mature in May. The young yam plant makes use of the residual soil moisture left by the rainfall. Watering, 2-3times a week, starts in December and ends in February. Mulching with dry grass reduces the frequency of watering . In locations like Port Harcourt near large bodies of water, occasional convectional rains occur in the dry season to re-charge the soil. Planting on beds is better than planting on mounds in the dry season, suggesting that yams can now be grown at the backyard watered from the tap with hose, watering can or bucket like vegetable gardens. The rains take over in the month of March till maturity in May. By the month of May, some of the upland yam farmers may still be planting. Thus Nigeria can now have two crops of yam in a year- the dry season crop (October -May) and the rainy season crop (March-October), ensuring availability of fresh tubers in the market all the year round. By changing the seasonal growth cycle of yam, every part of Nigeria can now grow yams by irrigation or watering. Yams planted in the dry season do not require stakes to support the yam vines. Previous research results at NRCRI, Umudike, had shown that the reason why yams are staked is to remove the yam vines from the physiological damage which flood water causes unstaked yams during the rainy season in the Rain-forest zone of Nigeria. Yams are grown without stakes in the Guinea Savanna zone. Hence staking of yams in the dry season does not increase the tuber yield of yams. It has been estimated that staking constitutes 25 per cent of the total outlay in yam production and cutting stakes from the bushes and secondary forests impacts negatively on the ecosystem. Planting yams without stakes in the dry-season therefore eliminates a major cost item in yam production and saves the ecosystem. Yield of dry season crop is also double the yield of the rainy season crop because of exposure to brighter and longer duration of sunshine, contributing to make the farming effort more profitable. In the seasonally- flooded locations along the River Niger such as Otuocha/Aguleri in Anambra state, farmers plant their yams around December/January. These tubers continue to remain dormant in the ground until the obligate sprouting time of February. The sprouts then emerge and begin to grow and develop because there is adequate residual moisture in their soils to sustain yam growth throughout the dry- season. The yam plants are exposed to the sunny period of February to May/June and that explains why Otuocha/Aguleri farmers produce large, ceremonial tubers. This location and their neighbours contribute the bulk of the yams sold in the Nigerian markets between the end of July and November. These yams which sprouted in February should mature in September/ October but they are usually harvested prematurely early in July 2-3months before full maturity. A close look at the tail of these tubers will show that they are light-yellow in colour, suggesting that they were still growing when they were harvested. The premature harvesting is caused by the fear of the River Niger overflowing its banks in July, August and September, causing flooding. It requires only 3-4 days of flooding for yam tubers to get rotten in the ground. Therefore, if the farmers of Otuocha/Aguleri adopt this technology and plant sprouted yams in October/November, they will harvest mature tubers in May/June, long before the River Niger overflows its banks from the end of July. To catch the early market, the farmers may still harvest their yams prematurely in March/April. The farmers will also grow their yams without stakes and harvest increased tuber yield because of exposure to more insolation, making the farming exercise more profitable. These yams harvested in May/June will sprout in October/November to continue the cycle. In all the seasonally- flooded plains along the major rivers of Nigeria- the fadamas- yams can be grown with this new technology. Indeed, it has been estimated that the fresh -water zone of the Niger Delta has the potential of producing 30 million metric tonnes of yam tubers in the dry-season annually. This potential exists not only in the flooded pains of the River Niger but also of River Benue and other rivers. Infact the dry- season yam production activity can exist conveniently in relay with swamp rice in these seasonally inundated areas. Some dams exist in Nigeria especially in the north and yams should be included in the dry- season crop production programme of these irrigated areas.Water supply through the boreholes is rapidly increasing in Nigeria and farmers in the upland locations can grow yams in the dry-season by watering. In Nigeria, yams are grown traditionally during the rainy-season in upland and lowland areas. When this production is added to that produced in the dry-season by irrigation, Nigeria will be harvesting a basket full of yams for domestic food self- sufficiency and surpluses for processing and export. Welcome to our monthly news update. We are delighted to let you know about a static version of GFU web site that will allow browsing off line. This should help in creating connections and spreading information about underutilized species amongst the less or non connected stakeholders. "Greater appreciation of local crops" - On the occasion of the 11th Regular Session of the FAO Commission on GRFA, the GFU will organize a side event to draw the attention of the Commission delegates to underutilized crops and their importance for the livelihoods of the rural and urban poor. The final objective is to eventually contribute to a change in national and international policies in such a way that they stimulate and enable the enhanced use of these important resources. We shall also be in Johannesburg during the same days at the FARA AGM and we will be there with a booth with information material and displays. Our interest is to raise attention amongst the attending stakeholders and delegations about the importance underutilized species carry. The database "Underutilized Species" is growing and if anyone would like to take ownership on a particular plant species you are more than welcome, let us know about experts, expertise and suggestions of any kind that will help us improve our service. We look forward to hearing from you about anything you would like to share and see included on this platform. 8th African Crop Science Society Conference to be held in El-Minia, Egypt, 27- 31 October 2007. Call for Concept Notes: Action Research on "Value Chains and the Rural Poor in Disadvantaged Regions"
Suggested Cultural Practices for Moringa UPDATED! Erosion of traditional knowledge and practice is a serious and accelerating problem, but quantitative work on traditional knowledge loss and its importance to biodiversity conservation is lacking. We investigated traditional knowledge of canoe making, a skill heavily dependent on plant biodiversity, on Pohnpei, Federated States of Micronesia, through a survey of 180 island residents. Our results showed that there has been an intergenerational erosion of canoe-making skills. Given current trends, the present generation of Pohnpeians may be the last to retain any knowledge of this traditional craft. We also identified several correlates of knowledge loss—including Western educational level and occupation—that highlight potential avenues for skill conservation via governments, traditional leadership, and schools. These institutions could intervene to emphasize traditional knowledge, which would reinforce institutional contexts in which traditional knowledge and practice is valued. The heightened awareness of the value of biodiversity that is linked to traditional knowledge is key to biological conservation on Pohnpei and can help support local conservation programs. Current research and development of the peanut crop or ground nut in Papua New Guinea is mainly undertaken by Ramu Sugar Limited, Trukai Farms and the National Agricultural Research Institute (NARI). This is through a collaborative project supported by the Australian Centre for International Agricultural Research (ACIAR) with a focus to improve peanut production. And a major objective is to develop and apply the satellite imagery technology to monitor spatial variability and improve productivity of peanut in Australia and to try and integrate the technology to monitor the peanut cropping systems in PNG. Ground-Truthing and Global Positioning System (GPS) referencing of peanut crops is one activity under satellite imagery technology, which allows for ground surveys for interpretation of satellite images. This is done through site surveys with the use of geo-spatial technologies (satellite imagery and GPS machines). From May 11-19, 2007 , Andrew Robson (Satellite Remote Sensing expert) from the Queensland Department of Primary Industry (QDPI), Australia, was in the Markham valley doing the ground truth exercise. With representatives from project partners, Mr Robson visited a number of peanut sites at Ramu Sugar, Trukai, NARI and some farmers' plots. The images for the sites visited, which will be acquired in June-July, will be used to assess the promising peanut varieties recommended, the crop rotation effect on farmers' fields, commercial blocks, and the local peanut gardens. The processed images have given a first hand glimpse of the best management practice of peanut farming. Data from pod and plant weights from the plots, which show the promising peanut varieties, can be correlated with the processed satellite images to support findings from peanut trials conducted. Some peanut farmers have realised the importance of peanut rotation effect. This practice can be promoted and adopted by PNG farmers for better crop yields. Apart from the peanut crops being a leguminous plant (natural fertiliser), the rotation technique can also break the disease cycle in the crops. Peanut farmers interviewed during the field visits appreciated the initiative and indicated their interest to adopt some of the best management practices such as planting in rows and the crop rotation effect. Ramu Sugar and NARI were introduced to a satellite image processing software - ENVI - and its application to peanut farming. The software will be used to assess the peanut crop health. These two organisations now have licensed copies of ENVI, which will process the satellite images provided by QDPI. Geographical Information Systems personnel from Ramu (Kelly Leo) and NARI (Mark Tinah) were briefly trained and are assigned on a full time basis to undermine the remote sensing work in order to achieve the ACIAR peanut project objectives. Meanwhile, a training on the remote sensing exercise and its application in Australia and PNG is planned for June/July in Australia. Galip nut (Canarium indicum), an indigenous tree crop which grows in the wild of Papua New Guinea, has the potential to become a new export cash crop once it is domesticated and commercialised. The National Agricultural Research Institute (NARI) has revealed this and commenced work to develop an industry for galip. Thanks to the European Union (EU) and the Australian Centre for International Agricultural Research (ACIAR) for funding various research projects implemented by NARI to develop the industry which will go a long way to benefit Papua New Guineans. The birth of the industry was signified last month when a project on PNG Nut Development was launched at Keravat in East New Britain. 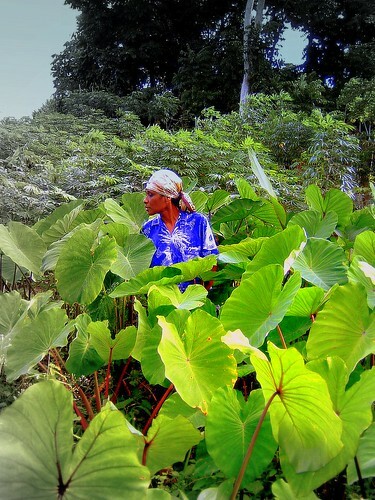 Research by NARI at its Keravat-based Lowlands Agricultural Experiment Station (LAES) for possible development of galip into new ventures showed that this indigenous and culturally important crop can be developed into a major cash crop industry for PNG which can generate income and other farming benefits for smallholder farmers. A feasibility study on galip, funded by ACIAR, at LAES between 2004-2005 concluded that galip was a feasible future export tree crop for PNG. Among others, this study examined the chemical composition of the nut and other quality traits of importance to a nut industry. The study also assessed the domestic and export markets and canvassed Australian nut buyers and processors. Another initiative, funded by EU to evaluate the commercialisation of a range of alternative cash crops at LAES from 2003 to 2006, finally chose galip and nutmeg for major development. During the launching of the recent project on April 24, again funded by EU, Chairman of NARI Council Dr John Kola said some 150,000 nut trees of galip will be established in East New Britain over the next two years. This, Dr Kola said, is to provide the resource base to kick-start the new industry, adding that they will come from some 100 elite galip trees that have been selected based on quality and high yield from over 6,000 trees. "These galip selections will be planted, predominantly in existing cocoa blocks, where they will act both as a shade for cocoa and provide cash income," Dr Kola said. "Galip can also be used as a shade for other cash crops such as coffee, pepper, vanilla and kava – providing the basis for a versatile, sustainable and environmentally friendly farming system. Galip trees after 30 years will still be compatible with the other crops and also offer the opportunity for income from quality timber." Dr Kola said the project will also establish a post-harvest unit at LAES for research, training and promotion of galip nut development. ACIAR has also provided funding for research on the domestication and commercialisation of galip nut based at LAES from 2006 to 2008. This project focuses on further galip tree selection and clonal propagation. Clones will offer the next level of industrial development for galip. ACIAR will also fund a three-year galip post-harvest project commencing in July 2007. This project will provide scientific and technical expertise, based on the Australian Macadamia industry, to work with, and complement that of the EU, to determine precise knowledge of post-harvest – the de-pulping, shell cracking, storage, drying, roasting, and packaging requirements. Dr Kola said substantial investment totaling some five million kina has already been made. He thanked EU and ACIAR for the recognition of the importance of cash crop diversification and financially contributing to the birth of the new galip industry for PNG. Drawa villagers in the interior of Vanua Levu count themselves lucky to be part of a community-based sustainable forest management initiative by the Secretariat of the Pacific Community (SPC) and the Pacific-German Regional Forestry Project (GTZ). Today, the villagers are reaping the benefits of this community-based initiative in terms of knowledge and skills gained through training and the added income from logging and farming. SPC coordinator Steven Hazelman said during discussions with the villagers in 2006, they asked for dalo planting material to help in food security and as an alternative source of income. "Instead of just supplying the planting material for the villagers, we decided to run training for them on the process of growing quality taro that will meet export requirements," he said. Drawa Village is located in the district of Wailevu, in Cakaudrove Province. The road to Drawa, however, originates from Lutukina district (past Seaqaqa) in Macuata Province. Getting to Drawa Village means crossing the Macuata-Cakaudrove border through some of the most rugged terrain on Vanua Levu. Mr Hazelman said the idea then was to start a model taro farm in Drawa that would give the villagers the opportunity to have a "hands-on-training" on all the recommended practices of producing export quality taro and to see first-hand how the quality can be affected through poor management practices. To get the project under way, SPC/GTZ collaborated with the Agriculture Ministry's research and extension divisions on the supply of dalo suckers and expertise on on-farm research trials. Mr Hazelman said the villagers were supplied with 6000 dalo suckers in 2006 to establish the dalo farm that acted as trial plots. "By assisting the researchers in the collection of data from land selection to harvesting, the villagers learnt valuable knowledge and skills on the correct way to run a commercial dalo farm. "Some of the things they learnt included the importance of analysing the fertility of their land through the soil testing method in order to supply dalo plants with the right amount of fertiliser, the importance of weed control and the right time to harvest for top quality corm. "Mr Hazelman said by addressing soil fertility, villagers were able to use land that was close to the village and which had been used many times over the years, to produce top quality dalo. "One of the concerns of the villagers was the increasing rate of clearing the forest areas around their village for farming. "As the soil loses fertility from constant use over the years, villagers kept clearing new areas for new crops. "Today, they have to walk for hours just to get to their farms and presented a growing concern on how far they had to carry farm inputs and produce." With the technology developed from the trial plots, the farmers have now realised they have the necessary knowledge and skills to improve production from idle land close to their village. Waisali Farms owner Sam Foi, who buys the taro from the villagers, is very happy and satisfied with the quality of the crop. This has given the villagers an added incentive to grow as an additional source of income to logging and yaqona. Mr Hazelman said from the 6000 dalo suckers they supplied, villagers now had over 20,000 suckers for the next crop. Drawa Village headman Laisenia Drodrolagi said the help and support provided by the SPC-GTZ, in collaboration with the Ministry of Agriculture, had given them hope and a new lease of life. "We had always relied on yaqona for income. Now we have two sources of income that we can tap," he said. "The village is grateful to SPC, GTZ and their partners for what they have done for us. "We hope this partnership will continue to grow for the benefit of the people of Drawa. "The training conducted by SPC-GTZ has enabled them to cultivate land closer to the village that had been left idle because of constant use and poor fertility. "Until the introduction of this technology, our farms were usually located on virgin land far from the village and we had to travel for hours on foot to reach them." The Drawa model area for community-based sustainable forest management encompasses 6345.5 hectares of mountainous terrain, covered with indigenous and restored secondary forest. Most of the area is in Cakaudrove, although a part of it is in Macuata. Mr Hazelmen said the model area was under native land tenure, with customary ownership belonging to 11 landowning units (mataqali). "There are six main villages for Drawa mataqali members and their households with Drawa and Vatuvonu located within the model area, Keka and Lutukina are in the periphery area and Batiri and Nayarailagi villages located north of the model area," he said. "In 1994, the Fiji Forestry Department selected the Drawa block as a model site for the sustainable management (SFM) of native forests in Fiji and this was the start of the partnership with the people of Drawa. "Since 1999, the Forestry Department with the support of the SPC/GTZ has been working with the landowners of Drawa to develop a community-based sustainable forest management regime for their natural forests. When the project started, the Drawa Block was under the concession of Fiji Forest Industries (FFI), which expired in 1999. FFI, at first maintained its right for extension, based on the old concession agreement of 1964, but after consultations and negotiations, FFI surrendered the Drawa Block in 2003. The Drawa Block is now under the concession of the community-based Drawa Forest Landowners Co-operative Ltd. (DraFCo), thus ensuring legal long-term security and control of their forest resources. Mr Hazelman anticipates the experiences gained from the Drawa model area will assist other viable community-based sustainable forest management regimes for native forests in Fiji and contribute towards the mainstreaming of participatory rural land use planning in Fiji. An unsteered ship may have delivered crop to Polynesia. How did the South American sweet potato wind up in Polynesia? New research suggests that the crop could have simply floated there on a ship. The origin of the sweet potato in the South Pacific has long been a mystery. The food crop undisputedly has its roots in the Andes. It was once thought to have been spread by Spanish and Portuguese sailors in the sixteenth century, but archaeological evidence indicates that Polynesians were cultivating the orange-fleshed tuber much earlier than that, by at least AD 1000. However, there's no hard evidence of people travelling between South America and the South Pacific so early in history. Most Polynesian crops have their origins in Asia, where the people are thought to have migrated from. Some scientists have suggested that sweet-potato seeds were carried in the stomachs of itinerant birds. Others suggested that Polynesians once voyaged to the Ecuadorian coast, and ­ foregoing such South American staples such as maize and Phaseolus beans ­ they brought back a root that reminded them of Asian yams. Still others proposed that the sweet potato floated 8,000 kilometres across open ocean, either in its spherical seed pod or in a drifting vessel. This last theory was dismissed in the 1970s, when a group of researchers ran what was then a state-of-the-art ocean-circulation simulation and concluded that the vessels would be extremely unlikely to drift into Polynesia by accident1. But Álvaro Montenegro, an oceanographer at the University of Victoria, British Columbia, says that this old model has "outlived its usefulness". Researchers now know, for instance, that the equatorial ocean currents travel much faster than previously thought; projections of drift have changed. Montenegro and his team used data from the Estimating the Circulation and Climate of the Ocean (ECCO) experiment, which combines a circulation model with 12 years of oceanographic measurements. This approach gives a glimpse of circulation patterns with a spatial resolution of about 50 square kilometres, and allowed Montenegro to consider 160 launch sites along the South and Central American coast compared with the earlier team's six. In the simulation, sweet-potato seed pods that started off in these American waters could reasonably hit seven different island groups, and had the best chance of landing on the Marquesas. "Among the three most likely targets that get hit, two are within the area where people believe the crop was introduced," says Montenegro. But the trip took at least four months. Even coconuts can't survive in salt water that long. More likely, says the team, a loaded vessel was blown out to sea and landed on the islands ­ which could take as little as 90 days, they report in an upcoming issue of the Journal of Archaeological Science2. Montenegro notes that seed pods are transported by currents alone, but a drifting vessel gains momentum from the wind. With 2,000 years between sweet-potato domestication in South America and its arrival in Polynesia, there have probably been numerous such drift events. But did people survive the trip, along with the crops? Montenegro says linguistic similarities between the Quechua word for the tuber, cumal, and the Polynesian one, kumala, suggest that humans must have been along for the ride. Patrick Kirch, an archaeologist at the University of California, Berkeley, who has worked on the issue, thinks that more extensive and deliberate contact must have taken place. "In my view, the most probable mechanism of transport was Polynesians sailing to South America," he says. The simulations, Montenegro says, simply demonstrate the feasibility of the drift theory, but a final verdict will depend on future archaeological findings. This approach may also help us understand how other plants, such as the bottle gourd, have drifted to the distant islands. And vessel drift is not just a thing of the past either. Montenegro points out that in 2005-2006, a fishing boat from Mexico was swept to the Marshall Islands ­ just as his model predicts. Levison M., Ward R., Webb J. &Levison M.The Settlement of Polynesia: A Computer Simulation, Univ. Minnesota Press, Minneapolis (1973). Cloin, Jan. (2007). “Coconut oil as a fuel in the Pacific Islands.” Natural Resources Forum 31(2): 119-127. The steadily increasing world market prices for fossil fuels in the past years have significantly increased interest in the development of indigenous sources of energy in the Pacific islands. As an import substitution strategy, many Pacific island Governments are looking into the use of local biomass resources to replace traditionally imported fuels such as petrol and diesel by biofuels. An overview of biofuel activities is given, with experiences and key achievements in Fiji, Samoa, Vanuatu, Solomon Islands, Papua New Guinea, Kiribati and Marshall Islands with regard to efforts to develop alternative fuels. There are strong linkages between developments in the various Pacific island countries and lessons to be learned from experiences and policies implemented among Governments in the Pacific region. The paper concludes that there is a need for standardization, quality control and testing facilities for biofuels in the region. Governments need to investigate further the level of support that is required to make biofuel operations viable and maximize macroeconomic and environmental benefits. MAY 20 : The Philippines’ coconut plantations are facing a pest infestation that’s threatening to wipe out output in the world’s biggest exporter of coconut oil in three years, an industry executive said. The spread of the coconut leaf beetle, known as brontispa longgissima, may further cut production in the Southeast Asian nation, which was hit by 20 typhoons last year, including four - supertyphoons packing winds of at least 185 km (115 miles) an hour, according to local forecasters. Prices may jump to $900 a metric tonne in the next few months, from $763.68 a metric tonne in April, Coronacion said. That compares with a record high of $988.4 a tonne in 1984. coconut oil prices surged 46% in April from a year earlier, according to the Philippine Coconut Authority. The Southeast Asian nation accounts for about 60% of global coconut-oil exports, according to the US Department of Agriculture. The commodity is used for cooking, making raw materials used to produce soap and mixed with regular diesel for an alternative fuel. The area planted with coconuts rose to 3.31 million hectares (8 million acres) in 2006 from 3.24 million hectares in 2005. The coconut leaf beetle infested 10 countries in Asia from 1999 through 2004, causing about $30 million in production losses on 7,229 hectares in Thailand in 2004, according to the Food and Agriculture Organization web site. UNITED NATIONS, May 18 (OneWorld) - If one is serious about addressing the climate change crisis, it might be wise to listen to those who have close and intimate knowledge of the lands and waters. "Mother Earth is crying," says Carrie Dann, an elder of the Western Shoshone indigenous people of the United States. "She is crying because she is wounded." Sharing Dann's concerns about the continued abuse of natural resources for commercial gains, Victoria Tauli-Corpuz, a leader of the native peoples of the Philippines, adds: "It's time to stop this senselessness." "Although in recent decades some progress has been made in the area of legal recognition of indigenous peoples' right to the protection of their lands, territories, and natural resources," notes Tauli-Corpuz, "in practical terms, this recognition has not translated into reality.
" Threats to indigenous peoples' lands and territories, according to Tauli-Corpuz, include such things as mineral extraction, logging, toxic contamination, privatization, and development projects, as well as the use of genetically modified seeds and technology. Most of the world's natural resources are found within indigenous peoples' traditional territories, where multinational corporations are allowed by governments to engage in logging, mining, and other operations that contribute to environmental degradation and climate change. In most cases, according to indigenous leaders, such operation take place without the prior and informed consent of the native communities who are most knowledgeable about their immediate environment and the animal and plant species that surround their lives. In fact, according to the 2007 UN Millennium Ecosystem Assessment report, which involved more than 1,300 scientists from 95 countries, before the industrial era, nearly 47 percent of the Earth's land surface was covered with forests; today the planet is left with only 10-percent forest coverage. The report shows that every year at least 10 million hectares of the world's forest are lost to unsustainable modes of economic development. These forests are home to about 80 percent of plant and animal species. Most are also home to a significant population of indigenous people, who have intimate knowledge about other forms of life around them. "The link between biodiversity and traditional knowledge is evident," says Djoghlaf, in whose view the Earth is a "spiritual mother who not only gives life and therefore food, but also provides the cultural and spiritual identity of its occupants." A COMPANY that was set up to export fruits to a subsidiary in New Zealand has reached markets in Australia, Canada and the United States. Operating from Bilalevu in Sigatoka, Mahen's Export now exports duruka, coconut, ivi and green ginger. General manager Anil Kissun said the company exported 2046 kilograms of breadfruit to New Zealand last year. "There is a huge demand for breadfruit in New Zealand and this shows the number of locals over there," Mr Kissun said. THE high demand for cassava should generate more employment in the export sector and put cash into the pockets of farmers. Food Processors Limited general manager Brij Lal said farmers were paid $600 a tonne for cassava export making it one of the high cash crops to date compared to sugar which paid nearly $50 a tonne. Mr Lal said they exported two containers of cassava to Fruiticana, a large food company in Surrey Canada which supplied Fiji food to the Indian community. Fiji's high commissioner to Canada Jesoni Vitusagavulu a former chairman of the company has been at the front of trade talks with United States and Canadian company's like Fruiticana. Mr Lal said it was fabulous the Fiji embassy in Washington could seal such a deal. "I would like to commend the good people in our embassy in Washington for being able to make this deal," Mr Lal said. "As a result of the new demand we needed to hire 20 casual employees. "Through this deal I am also keeping farmers in their farms in rural areas and stopping the urban drift and the influx of rural dwellers into squatter settlements." Farmer Ananaiasa Waqanibau of Nacokaika in Naitasiri said he used to sell cassava at the Suva market for $25 a bag (20kg) and he would be asked to only choose the larger crops. "Now I can uproot all my plots and sell all the crops instead of picking the big ones. This way I am thankful to the company for taking my root crops," Mr Waqanibau said. "Once we begin to export quality cassava on a frequent basis we could think about increasing the exports to four containers at a time," he said. "Export will create additional employment and bring in foreign exchange," Mr Lal said. KOCHI: International Coconut Summit (ICS) on Friday drew a 12-point 'Kochi Declaration' to lay emphasis on adopting organic agriculture for coconut farming. The ICS, which concluded today, suggested that coconut farmers should be encouraged to practice organic management of coconut holdings for optimum productivity without causing degradation of the ecology. Coconut farmers should be trained in soil and water conservation, recycling and use of on-farm organic resources, in the concept and practice of weed suppression without resorting to frequent tillage operations, target specific pest and disease control through the use of biological ormulations, the declaration recommended. The declaration also pointed out the need to popularise efficient product utilisation and for achieving significant increase in production and productivity of coconut at the global level it was essential to undertake a massive replanting and under planting in the major coconut growing countries on a priority basis. It also emphasised the need for popularising coconut based health foods and beverages. The five-day summit also recommended evolving appropriate technologies for value addition in coir. Former Union Minister O Rajagopal gave away the International Coconut Summit's 'Kalpavriksha' awards to six people for their contribution towards propagating and development of coconut sector. THE European Union has a long-standing commitment to regional integration because it is the agenda of the member states of the Pacific Islands Forum. Head of the EU delegation for the Pacific, Doctor Roberto Ridolfi made the comment at the Europe Day celebration in Suva last night. He said there must be innovation and common sense in order to present options for economic and political integration. "The Pacific countries have the Pacific Plan which is an ideal platform on which the framework for a successful Pacific regional integration can be achieved," he said. "There must be innovation, but also common sense in order to present options for future economic and political integration in the Pacific, keeping always in mind the importance of sustainable development of working for our children,'' he said. "The immense Pacific biodiversity gives richness to all human kind and it is everyone's interest to preserve this region as much as possible while inducing development and prosperity through economic growth." He said the Ocean of Islands could offer answers for some of the pressing problems the future of the Pacific. Dr Ridolfi issued a reminder at the celebration of the need to better manage natural resources. "Natural resources have to be managed by humans through policies and ethical behaviour," he said. "Hence, developing a common European foreign policy and strategy has become an imminent necessity. Although this European goal has yet to be achieved totally, being one of our major challenges, we are nevertheless, already the world's largest donor, providing 60 per cent of the world's official development assistance. "The European Commission alone gives over F$15.5billion of EU taxpayers' money for development assistance virtually to the whole world, in transition and in development, every year." Europe Day is celebrated on May 9. SPREP and the Roundtable for Nature Conservation have announced that the 8th Pacific Islands Conference on Nature Conservation and Protected Areas will take place on 22-26 October 2007, in Alotau, Papua New Guinea. The Conference is a key regional meeting of government agencies, NGOs, community based organisations, and donor bodies to discuss and develop a joint vision for conservation in the Pacific Islands. The theme of the Conference is 'Conservation serving communities, in a rapidly changing world' highlighting the inseparable link between Pacific Islanders and the natural environment; people and the sustainable use of their natural resources, to ensure that the unique Pacific environment is protected. Globally, there is a growing acknowledgement of the role of communities in driving conservation efforts. In the Pacific, there is a renewed understanding that successful conservation of biodiversity in the Pacific is ultimately about community participation and leadership. A key outcome of this important conference is the development of a regional framework to guide nature conservation in the Pacific Islands. This Conference will review the successes of the Action Strategy for Nature Conservation (2003-2007), the Pacific's overarching framework for biodiversity conservation. The Strategy was developed in 2002 by more than 300 environment practitioners, government officials, and NGO representatives. Unless a publication is indicated to be Web only, printed copies, when available, are circulated to departments and Hawaii libraries, and copies for starter inventories are sent to CES offices. Place orders for additional quantities of printed copies of free publications by e-mail to ctahrpub@hawaii.edu. Sabry Shehata, Linda Cox, BIO-7, 8 p.
shipments to the U.S. mainland market than their foreign competitors? EI-10, 8 p., EI-11, 15 p.
Aurora Saulo, Louis Divinigracia, Rochelle McArthur, ET-7, 3 p.
Aurora Saulo, FST-24, 2 p.
Glen Fukumoto, Yong Kim, FST-25 7 p.
Dwight Sato, Namiko Ikeda, Tomomi Kinoshita, FST-26, 2 p.
Mike DuPonte, Kara Lee, LM-14, 2 p.
Mike DuPonte, LM-15, LM-16, @3 p.
Dwight Sato, SCM-17, 1 p.
John Cho, Roy Yamakawa, Jim Hollyer, SA-1, 8 p.
BONN, Germany (Reuters) - From apples to zebras, all 1.8 million known plant and animal species will be listed in an Internet-based "Encyclopedia of Life" under a $100 million project, scientists said on Tuesday. The 10-year scheme, launched with initial grants of $12.5 million from two U.S.-based foundations, could aid everyone from children with biology homework to governments planning how to protect endangered species. "The Encyclopedia of Life plans to create an entry for every named species," James Edwards, executive director of the project which is backed by many leading research institutions, told Reuters. "At the moment that's 1.8 million." The free Encyclopedia would focus mainly on animals, plants and fungi with microbes to follow, blending text, photographs, maps and videos in a common format for each. Expansion of the Internet in recent years made the multi-media project possible. Demonstration pages at http://www.eol.org include entries about polar bears, rice, death cap mushrooms and a "yeti crab" with hairy claws recently found in the South Pacific. "This is about giving access to information to everyone," Jesse Ausubel, chairman of the project who works at the Rockefeller University in New York City, told Reuters. The Encyclopedia would draw on existing databases such as for mammals, fishes, birds, amphibians and plants. English would be used at the start with translations to other languages. Edwards said the project would give an overview of life on earth via what he termed a "macroscope" -- the opposite of a microscope through which scientists usually peer. Species would be added as they were identified. Edwards said there might be 8-10 million on earth, adding that estimates ranged from 5-100 million. Fossil species may also be added. The encyclopedia, to be run by a team of about 25-35 people, could help chart threats to species from pollution, habitat destruction and global warming. The project would be led by the U.S. Field Museum, Harvard University, Marine Biological Laboratory, Missouri Botanical Garden, Smithsonian Institution, and Biodiversity Heritage Library -- a group that includes London's Natural History Museum, the New York Botanical Garden, and the Royal Botanic Garden in Kew, England. Initial funding comes from a $10 million grant from the John D. and Catherine T. MacArthur Foundation and $2.5 million from the Alfred P. Sloan Foundation. Extra funds would be raised in coming years. Ausubel noted that 2007 was the 300th anniversary of the birth of Sweden's Carl Linnaeus, influential in working out ways to classify species. "If he were alive today we think he'd be jumping up and down celebrating," he said. Honolulu, May 1. (AP): Despite cultural and environmental concerns, researchers at the University of Hawaii are performing genetically modified crop research on several flowers, fruits and vegetables to develop hardier, disease-resistant plants. Genetically modified, or transgenic, crops are plants that have been altered by the transfer of genetic material from another species. Some researchers are eager to explore their potential, but soem farmers worry that genetically modified breeds could escape the university environment and eventually overrun native varieties. The university's College of Tropical Agriculture and Human Resources has ongoing research on pineapple, orchids, anthuriums, bananas, tomatoes, petunias and lettuce. The university is also trying to develop sugar cane that is genetically modified to produce a vaccine to protect against rotavirus, a viral infection. The university's research resulted in the development of a ringspot-virus resistant papaya, which has helped manage the impact of the virus. Opponents of genetic crop research and genetically modified food contend that not enough is known about the long-term impact of such products. Many countries, including Japan, will not import transgenic papaya. Some scientists are reluctant to do their own genetically modified crop research because of such concerns, said C.Y. Hu, associate dean and associate director for research at the College of Tropical Agriculture and Human Resources. ``It's actually going down because we have a lot of faculty saying there's no point in doing this,'' he said. More than 57 Australian exhibitors (Australia Pavilion Stand #1515) are at BIO 2007, part of Australia's 400-strong delegation. Among these are some of the most innovative research centres and universities in the region such as Griffith University which is launching its "Nature Bank", a bank of more than 400,000 compounds from plants and marine invertebrates ready for drug trials. The "Nature Bank" (Queensland Compound Library), which has taken more than 10 years to assemble, features unique compound samples collected from flora and fauna across Australia's tropical north including the famous Daintree Rainforest and the Great Barrier Reef, parts of China and the remote and largely untouched tropical forests of Papua New Guinea. Invest Australia's Senior Investment Commissioner for North America, Fred Welz, said the Australia Pavilion at BIO 2007 showcased some of the most attractive investment and partnering opportunities from our world renowned research centres and innovative biotech firms. The "Nature Bank" was just one example of the rich vein of opportunities available to US biotechs and pharmas who cast their net across the Pacific to Australia for drug candidates, medical devices and world class R&D. Project leader Professor Ron Quinn of Eskitis Institute for Cell and Molecular Therapies at Australia's Griffith University said Australia's bizarre flora and fauna had evolved in isolation from the world for millennia, creating a unique biodiversity hot-spot. Professor Quinn said naturally-occurring biological products were a better 'fit' with biology of the human body than many synthetic substances, and were still the main medicines used by 80 per cent of the world's population. "Many of the world's leading drugs are natural product derived. The cholesterol-lowering drug lovastatin (Altocor(TM)) was derived from a fungus. The next generation drug atorvastatin (Lipitor(TM)) is the world's largest selling drug and is synthesised in a lab. "Another example is the breast cancer drug paclitaxel (Taxol(TM)), which was derived from the stripped bark of the Pacific Yew tree," said Professor Quinn. Welz notes that Australia was ranked first in the Asia-Pacific as a biotech location, and Australia's intellectual property protection is world class. Its patent and copyright enforcement regime is ranked second best in the Asia-Pacific and sixth worldwide and ahead of the US. People on the island of Bougainville in Papua New Guinea have found their own solution to high energy prices - the humble coconut. They are developing mini-refineries that produce a coconut oil that can replace diesel. From police officers to priests, the locals are powering up their vehicles and generators with coco-fuel. Inquiries for the coconut power have come in from overseas, including Iran and Europe. For years, the people of Bougainville have been dependent on expensive fuel imported onto the island. Shortages have often caused many businesses in this part of Papua New Guinea to grind to a halt. High energy costs have not helped either. Increasingly, locals are turning to a cheaper and far more sustainable alternative to diesel. Coconut oil is being produced at a growing number of backyard refineries. Matthias Horn, a German migrant and an engineer, operates one such refinery. "They sometimes refer to me as the Mad German because how can you do that to your car... filling it with some coconut juice that you normally fry your fish in," he said. "The coconut tree is a beautiful tree. Doesn't it sound good if you really run your car on something which falls off a tree and that's the good thing about it. You run your car and it smells nice and it's environmentally friendly and that's the main thing." Mr Horn said his work had attracted interest from Iran. Refineries like his also produce oils for cooking and cosmetics as well as soap. Coconut power is not new in Bougainville. The island endured years of civil unrest in which thousands of people were killed in a fight for independence in the 1990s. Dwindling supplies of diesel forced islanders to look for alternatives and the coconut was chosen. In peacetime, new technology is propelling this sweet-smelling industry to greater heights. The conservation and management of forest genetic resources has been a major concern in the Pacific region. The significant loss of biodiversity due to destructive human activities associated with mining, agricultural clearing and commercial logging, particularly within the larger Melanesian countries, has featured in many international forums where issues like extreme poverty, climatic changes and environmental degradation are now the main focus of concern. It has become a major economic and environmental issue as to whether these countries can justify the present rate of exploitation of their forest resources. Several commercial timber species have become rare due to indiscriminate logging while many culturally valuable species are threatened by heavy harvesting for traditional uses such as wood carving, firewood and medicine. The Pacific forests and trees are increasingly threatened in many ways including over-utilization, land-use change and climate change. The Workshop to be held in June 2007 will aim to update the Action Plan developed in Apia in 1999 after assessing progress in its implementation over eight years. The revised plan will provide an agreed framework which suits the needs and priorities of each PCITs in relation to forest genetic resources conservation and management. FGR priorities for each country will be strongly linked to its wider development priorities. Although there has been a notable increase of interest among PICTs in developing research and action plan on FGR, there have been modest achievements due to management and governance issues, limited national budgets and shortages of trained personnel to implement approved FGR programs. The FAO Panel of Experts on FGR on its 14th Session held early this year in Rome, Italy, has recommended a stronger action to support the management of forest genetic resources to achieve sustainable forest development and the current updating of the State of the World’s Forest Genetic Resources should further clarify the contribution of forest genetic resources to the achievement of MDG 1 (to reduce extreme poverty and hunger) and MDG 7 (to ensure environmental sustainability). Enhance regional cooperation offers an effective solution towards a successful program on forest genetic resource conservation and management in the Pacific. Given the small size and limited resources of many Pacific countries, it is vital that a regional approach is adopted, such that information and genetic resources can be readily exchanged among SPC member countries and territories. · Develop a Pacific Island Regional Research and Development Agenda and an Action Plan for improved governance in the conservation, management and sustainable utilization of forest genetic resources, including a plan of follow-up activities after the Workshop. · Strengthen and explore opportunities for collaboration amongst PICTs, other international and regional organisations and donor agencies with emphasis on forest genetic resources conservation and management and its application to poverty alleviation, rural development and climate change, within a community forestry framework. The third day of the workshop shall be set aside for the preparation of the Action Plan for improved governance in research and development on the conservation and sustainable use of forest genetic resources within a community forestry framework. This will incorporate recommendations on future strategies, and possible regional projects for implementation and will include a discussion on the proposed establishment of a regional forest tree seed bank. The fourth day will be set aside for discussions on relevant issues to Pacific Forestry such as impact of climate change, logging code of practice, forest certification, biofuels and carbon offsets, invasive species and maximizing role of Pacific forests and trees to the well-being of the Pacific Islanders. The fifth day will be a field visit to Fiji Pine plantation areas and the Fiji Forestry Department Sandalwood seed stand planting near Lololo . Participants will be from the 22 Pacific Island Countries and Territories. Invitations will be extended to international and regional governmental organizations, non-government organizations, civic, youth and gender-based organizations and academic institutions. Main target group will be technical officers of the respective forestry agencies who are currently involved in forest genetic resources conservation and management, research and development, and extension works in their countries and territories. The workshop will be organized by the Forests and Trees Programme, Land Resources Division of the Secretariat of the Pacific Community (SPC) in partnership with ENSIS (formerly CSIRO Forestry and Forest Products) and with co-funding support from the Australian Government (AusAID through its Pacific Governance Support Program). It is the Phoenix Islands Protected Area. With eight atolls and two submerged reef systems, the nearly uninhabited Phoenix Islands Protected Area (PIPA) is the largest marine protected area in the Pacific Islands at 184,700 square kilometers (73,800 square miles), twice the size of Portugal. It contains a near pristine coral archipelago with abundant marine and bird life, and is the first marine protected area in the region with deep-sea habitat, including underwater mountains. This is the MPA that covers the entire 8 atolls with all terrestrial resources like coconut crabs, plants and trees, and the birds which are so abundant there. Then the closure moves down to the sea and ends up at the seamounts where pelagic resource is so abundant. PIPA office is under the Ministry of Environment, Lands and Agricultural Resources but its national steering committee is made up of all relevant national authorities and stakeholders. Meaning that this is the national project of Kiribati. The Distant Water Fishing Nations (DWFN) would be disappointed with the plan to close this area, especially when this is the most productive areas in terms of tuna commercial fishing. PIPA's plan however, in close collaborations with offshore partners, the New England Aquarium (NEA) and the Conservation International (CI), is to set up the Trust Fund or Endowment Fund that would stand as compensation (licence fees from DWFN which will be stopped in due course) to Kiribati as it moves to stopping the DWFN in PIPA. With the help of NEA and CI, we are going to identify donors who will support the setting up of this trust fund. Currently, we are now finalising works on the management plan of PIPA and then to be followed by monetary valuation of all land and marine resources of PIPA, as this will help us to determine the initial funds to go into the trust fund. PIPA is looked at by our HE Preseident Anote Tong as a symbol of Noah's Ark, which floats out there conserving all species of creation and with a mission that the biodiversity and natural beauty of the Phoenix Islands are preserved while the resources are held in store for the needs of all mankind in the future. For generations, Pacific islanders have carved their traditions, culture and living from the natural resources of land and sea. The Pacific way, our island life, is built on a foundation of respect for the environment and the natural systems that sustain our livelihoods. Within the current global climate of change, there is an urgent need to work with communities to learn to adapt the onset of changes in order to protect Pacific history, culture and traditions. Throughout the region, considerable resources are invested in areas that will help communities and governments prepare for change. There is a critical urgency to invest in people—to build the social capital of the Pacific islands; to ensure that the future leaders are equipped with the skills, knowledge, outlook and commitment to use the limited natural resources with the least impact on the fabric of Pacific identity. To help them make decisions that meet the needs of the present, without compromising the needs of the future, and with respect for the past. That’s what this article is about.From April 2-4, SPREP and UNEP brought together more than 30 young people: current and aspiring professionals, working or studying in the environment field, to attend the Pacific Future Environment Leaders Forum in Apia, Samoa. Representing 14 Pacific countries and territories, the Forum explored the notions of global and regional leadership, whilst providing sessions in practical skills pivotal to strong environmental management including project management, proposal writing, and negotiation skills. The participants included a large contingent of students from USP in Suva, who came with smiles, a guitar, energy and a desire to learn and share their knowledge and experiences. The Forum allowed the young people to look forward to the future, to envision the impact of issues such as climate change. In one of the sessions, the participants learnt about the effects of climate change on their communities, such as drought, sea level rise, effects on agriculture and biodiversity loss. Within these scenarios, the participants then developed possible community-based adaptation measures. This Youth Forum was the first regional capacity building workshop, facilitated by SPREP, which was aimed directly at young people promoting environmental sustainability in the region. The Forum is part of an ongoing programme for future leaders in the environment sector as part of SPREP’s commitment to build capacity of Pacific islanders for strengthening environmental management. The Forum complemented the work undertaken by the Secretariat of the Pacific Community (SPC), to support young people in the region; it was a privilege to have the presence and participation of a key SPC representatives throughout. Samoa’s Ministry of Natural Resources and Environment provided support in an ongoing partnership with SPREP.Amidst the uncertainty of the future, there is a growing recognition of the critical need for strong voices from the region. Voices that will share with the rest of the world the needs, the complexities, and the right solutions for the more than 8 million people living in the Pacific. Voices that will take the messages from the people of the vast Pacific islands region to a global platform. The forum provided an opportunity to strengthen the Pacific Youth Environmental Network (PYEN), established by UNEP to act as a vehicle to unite the growing numbers of young Pacific Islanders who are concerned about protecting the Pacific environment.The challenge now for young people is to embody the change they wish to see in this region: to have the courage to embrace the principles, spirit and integrity to continue to strive for the change that needs to happen in the Pacific; to become the Pacific’s future environment leaders; and to ensure that the beauty, uniqueness and diversity of the Pacific islands are protected for future generations.